In this scenario, specific devices on the LAN are allowed to various services on servers located on the Internet. · Block HTTP and HTTPS access from PC1 to Server1 and Server2. The servers are inside the cloud and you only know their IP addresses. · Block FTP access from PC2 to Server1 and Server2. · Block ICMP access from PC3 to Server1 and Server2. Note: For scoring purposes, you must configure the statements in the order specified in the following steps. Step 1: Deny PC1 to access HTTP and HTTPS services on Server1 and Server2. a. Create an extended IP access list named ACL which will deny PC1 access to the HTTP and HTTPS services of Server1 and Server2. Because it is impossible to directly observe the subnet of servers on the Internet, four rules are required. What is the command to begin the named ACL? b. Record the statement that denies access from PC1 to Server1, only for HTTP (port 80). c. Record the statement that denies access from PC1 to Server1, only for HTTPS (port 443). d. Record the statement that denies access from PC1 to Server2, only for HTTP. e. Record the statement that denies access from PC1 to Server2, only for HTTPS. Step 2: Deny PC2 to access FTP services on Server1 and Server2. a. Record the statement that denies access from PC2 to Server1, only for FTP (port 21 only). b. Record the statement that denies access from PC2 to Server2, only for FTP (port 21 only). Step 3: Deny PC3 to ping Server1 and Server2. a. Record the statement that denies ICMP access from PC3 to Server1. b. Record the statement that denies ICMP access from PC3 to Server2. Step 4: Permit all other IP traffic. By default, an access list denies all traffic that does not match any rule in the list. What command permits all other traffic? The traffic to be filtered is coming from the 172.31.1.96/27 network and is destined for remote networks. Appropriate ACL placement also depends on the relationship of the traffic with respect to RT1. Step 1: Apply the ACL to the correct interface and in the correct direction. a. What are the commands you need to apply the ACL to the correct interface and in the correct direction? Step 2: Test access for each PC. a. Access the websites of Server1 and Server2 using the Web Browser of PC1 and using both HTTP and HTTPS protocols. b. Access FTP of Server1 and Server2 using PC1. The username and password is “cisco”. c. Ping Server1 and Server2 from PC1. 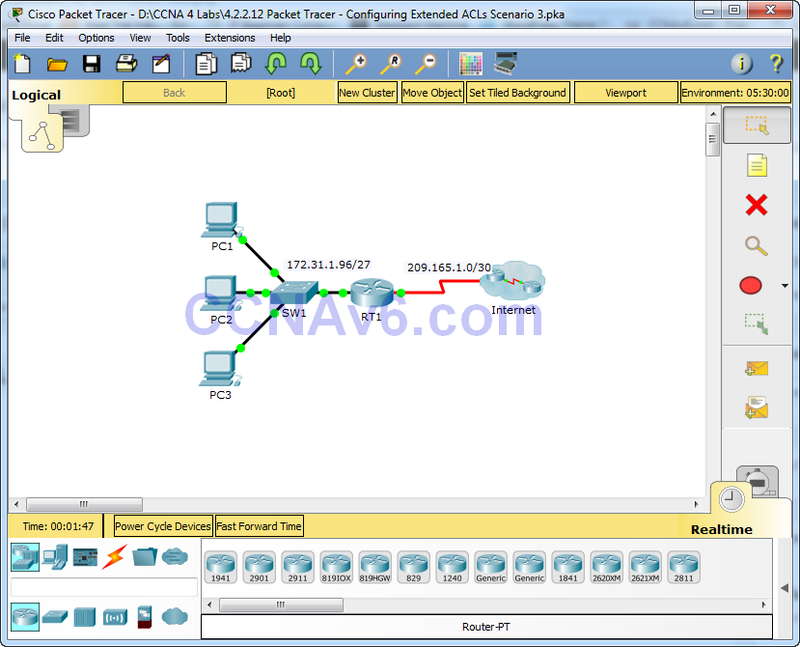 d. Repeat Step 2a to Step 2c with PC2 and PC3 to verify proper access list operation. I will add the answer soon.